Ostia Antica is one of the most important ancient excavations in Italy. Ostia is a port city on the Mediterranean Sea, just 30 km from Rome. The river Tiber flows here into the Mediterranean Sea. Ostia Antica was in the antiquity the port of Rome at the sea. The place around the port had up to 50.000 inhabitants at that time. The old port city Ostia is the largest and most visited excavation around Rome. Every day thousands of tourists visit the remains of the ancient city. 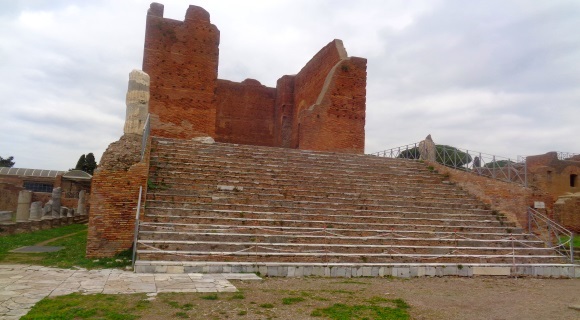 You can reach Ostia Antica easily, quickly and cheaply by train from Rome. In Rome, take the Metro B (blue line) to the Piramide stop. This is 2 stops south of the Colosseum or one stop south of the ancient Arena Circus Maximus. Now you change to the S-Bahn to Ostia. These trains depart from Porta S. Paola station, which is connected to Piramide metro station. After about 25 minutes by suburban train you reach Ostia Antica station. Get off there. It is pleasant that Ostia is today a district of Rome. Thus, you can go with normal tickets of the Roman local traffic to Ostia. A simple ticket costs only 1,50 Euro, also the day tickets, multi-day tickets, week tickets for Rome are valid. This metro to Ostia departs every 15 minutes during the day. After getting off at Ostia Antica you leave the train station. Cross the blue bridge over the expressway and go straight ahead. There are signs or just follow the many other people who all want to go to the Ostia Antica excavation. You should take food and drink with you. 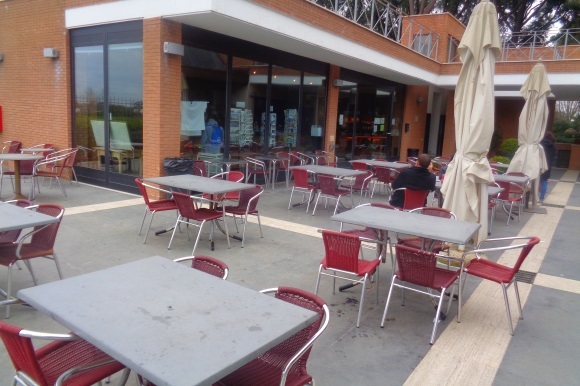 In the huge excavation area of Ostia there is only one cafeteria. Here there are often long queues and the prices are rather high. Especially in summer: Take enough water with you. At the ticket office you pay the entrance fee (see below for entrance fees to Ostia Antica). After the ticket control it finally starts. After the entrance you should go straight on the wide way. To the left and to the right of this path most of the big sightseeings of Ostia Antica come in the next kilometre. The area of the excavation is gigantic. From one end to the other, you walk over half an hour, thus more than 2 kilometres. You can walk almost everywhere, walk into the remains of the old buildings, sometimes go up stairs and much more. You absolutely need a useful map of Ostia Antica, otherwise it is difficult to find the important sightseeings. As already mentioned, the excavation has several square kilometres, thus some hundred hectares. If you don’t have a map, you should buy a plan at the cash desk (2 Euro at the beginning of 2019). Most visitors go first to the Therme des Neptun, one of the big sightseeings. It is not far from the entrance. You should never miss the floors in the Therme. Many of the other important sights are around the Forum, the former centre of the ancient city. Here are many former government buildings, temples, churches, market, an antique restaurant, mills and much more. The only modern building is the museum. Many sculptures and other important items excavated in Ostia have been brought into the museum. Here they are not stolen or damaged and are safe from rain and so on. The museum is one of the most important sights in Ostia Antica, don’t miss it. Behind the museum is the above mentioned cafeteria, the only place in the big excavation Ostia Antica where you can buy food and drinks. At least we didn’t see anyone else. The cafeteria in the morning. In summer in the afternoon there is a lot going on here. You should also go further and look at the old houses. After that you have to walk all the way back. There is also an entrance and an exit on the other side of the excavation site, but no train station. 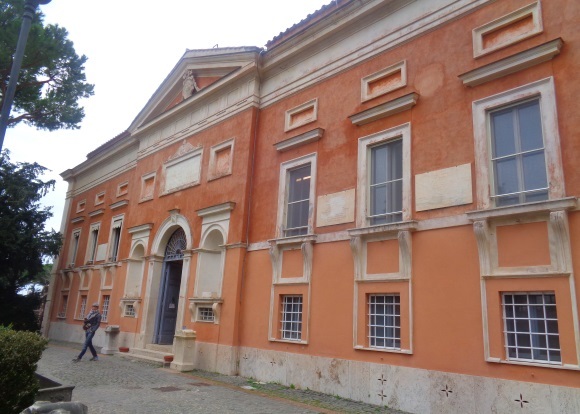 We recommend to take the train a few stations further and to look at today’s city Ostia. You can get off at Ostia Cento and go down to the sea (one kilometre). Actually, Ostia is not a city of its own, but a district of Rome with 200,000 inhabitants. But Ostia looks like a city of its own. Afterwards, you simply take the train back to Rome. The admission price has recently been increased from 8 Euro to 10 Euro (February 2019). Important: 1. children under 18 years don’t have to pay admission, and visitors up to 25 years only half! 2nd Free entry on the first Sunday of the month for all! Otherwise Tuesday to Sunday from 8:30 to at least 16:30 in winter. In summer longer in the evening, because longer is bright, depending on the month until 18 o’clock or 19 o’clock. Closed except Mondays only on important holidays like Christmas and New Year. The visit of the excavation is very interesting and in any case recommendable. The entrance fee for Ostia Antica of 10 Euro is ok.
You should consider that you look at an ancient city with formerly 50.000 inhabitants. Thus, the area is very extensive. You will walk many kilometres. The paths are easy to walk for people without disabilities. The whole thing reminded us a little of Pompeii. Both are excavations of a complete city. If Ostia the houses etc. are however substantially worse preserved. Usually only the foundation walls are 1 to 2 meters high. But also in Ostia there are whole rooms and even 2-storey buildings, which you can see completely. The state of preservation in Ostia is generally much worse than in the excavation in Pompeii. There is much less activity in Ostia than in Pompeii. There are no queues at the important sights (as in Pompeii) in Ostia. 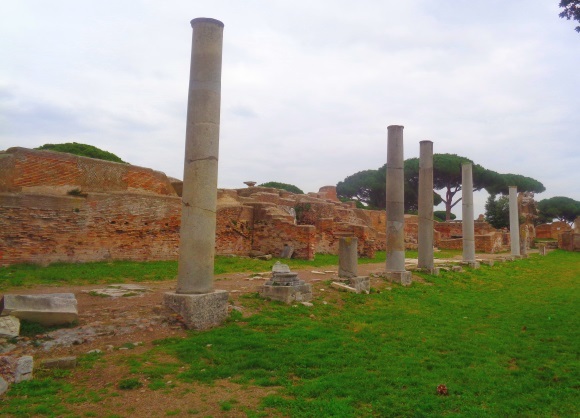 We liked Ostia Antica very much, it is one of the top 10 highlights in Rome for us. Total cost of Rome only 13 Euro per person (10 Euro entrance fee and 2x 1,50 for the train there and back). 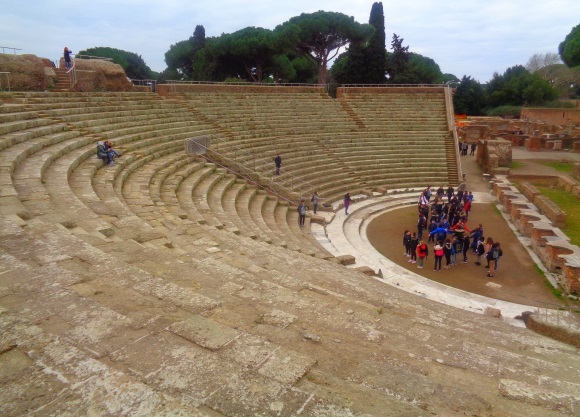 Important: Take provisions and water with you, read something about Ostia Antica beforehand, put on good shoes (long distances) and take a good plan of Ostia Antica with you or buy a plan at the box office for 2 euros. The Forum: The former central square of the city, some parts are well preserved. Thermen: As in all major excavations of ancient Roman cities, Ostia also has thermal baths with baths and saunas. There were several. The most important are the Terme del Foro (Forum Baths) in the centre, the Mithras Baths and the Neptune Baths. 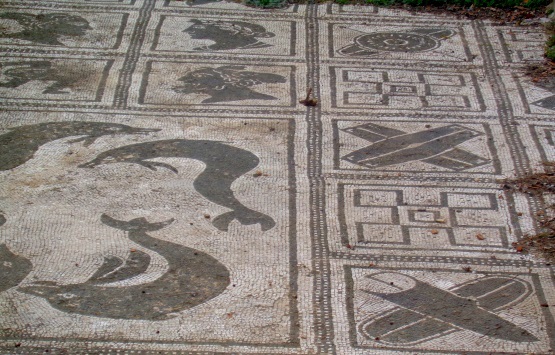 In the thermal baths of Neptune, the floors with black and white pictures (mosaics) are worth seeing (see picture above). The theatre: An open-air theatre with 3000 seats, almost completely preserved. For many visitors the highlight of Ostia Antica. Houses: Some 2000 year old apartment buildings are very well preserved in Ostia Antica, some have 2 floors. Temples and churches: You can see several ruins of such buildings. Temples of the Christianization of Rome, and churches afterwards. Even a synagogue was recently excavated. The Museum: Here are all the sculptures etc. found in Ostia Antica. Be sure to have a look. You could go on with the list. Interesting are also many small things, you can freely run around in the several square kilometers large area and discover much.